Green bell peppers, which are also known as sweet peppers, have not been cultivated in a massive way in the United States until the mid-20th century. The vitamin C content of green bell peppers (119.8 milligrams, which is over and above the 75 and 90 mg daily requirement for women and men, respectively) contributes to stronger immunity and healthier skin, blood vessels, gums, and teeth. Green bell pepper can help regulate cholesterol levels, therefore preventing the onset of diabetes. 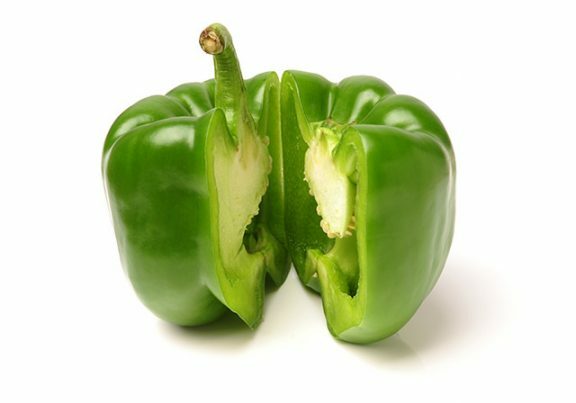 Green bell pepper is a good food choice for weight-watchers. It leaves a full feeling, which ensures that you don’t get to eat a large amount during your next meal. Green bell pepper has anti-inflammatory properties. Its luteolin content (five mg in a 100-g serving) is responsible for inhibiting some types of cancer cells, particularly color cancer cells, ScienceDaily.com reported in a 2012 article. Green bell pepper is good for the skin. According to a 2012 PLOS ONE article, the quercetin that is found in green bell peppers are very effective when it comes to treating contact dermatitis and skin photosensitivity, which is caused or aggravated by exposure to sunlight and can lead to skin cancer. Green bell pepper is good for the digestive system. Its fiber content, which is around 2.5 grams toward the daily recommendation of 21 to 25 grams for women and the 30 to 38 grams for men in a one-cup serving, prevents constipation and hemorrhoids. Green bell pepper is good for the ocular system. It contains zeaxanthin, which prevents vision impairment and reduces the risk of developing age-related eye disorders like macular degeneration and cataracts. Green bell pepper is good for the cardiovascular system. It lessens your risk of incurring a heart ailment. Green bell pepper is good for the immune system. Its vitamin E content aids in protecting cells from damage. As a matter of fact, a study that was published in the Bulletin of University of Agricultural Sciences and Veterinary Medicine in 2006 stated that the antioxidants in green bell peppers can lessen the extent of free radical damage, which can result in heart problems, cancer, or inflammations of the organs. The pyridoxine in green bell peppers, on the other hand, aids your body in producing antibodies that can stave off the influx of diseases. Chopped green bell peppers can spice up your spaghetti sauce or lasagna recipe. They can enliven scrambled eggs and add flavoring to a lean turkey or chicken sandwich. Green bell peppers are also a good addition to vegetable, chicken, or minestrone soup. They are also an essential staple to salads. For more green bell pepper recipes, visit this page. Green bell pepper is good for the digestive, ocular, cardiovascular, and immune systems. Green bell pepper is good for the skin.